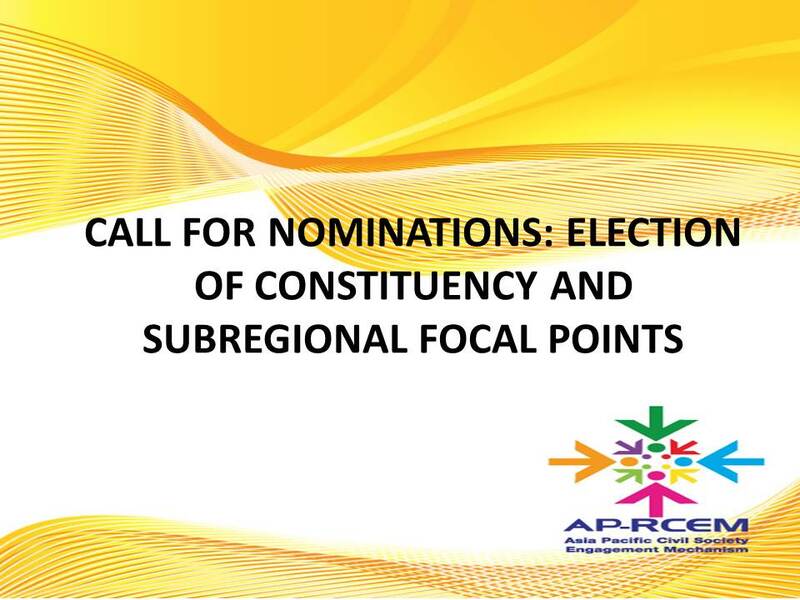 The current Transition Committee (TC) of the Asia-Pacific Regional CSO Engagement Mechanism (AP-RCEM) is opening the Call for Nominations for the Election of Constituency and Sub-Regional Focal Points [AP-RCEM Regional Coordinating Committee]. What is the AP-RCEM? APRCEM is a civil society platform aimed to enable stronger cross constituency coordination and ensure that voices of all sub-regions of Asia Pacific are heard in intergovernmental processes in regional and global level. The platform is initiated, owned and driven by the CSOs, and has been set up under the auspices of UN-ESCAP and seeks to engage with UN agencies and Member States on the Post-2015 as well as other development related issues/processes. As an open, inclusive, and flexible mechanism, RCEM is designed to reach the broadest number of CSOs in the region, harness the voice of grassroots and peoples’ movements to advance development justice that address the inequalities of wealth, power, resources between countries, between rich and poor and between men and women. What are the Constituencies of the APRCEM? To gather the broadest voices from the region, our structure is tailored to ensure the representation from 17 constituencies (women, farmers, fisher folks, SME, indigenous peoples, NGO, science and technology, older groups, people with disabilities, people living and affected by HIV, migrants, trade union and workers, local authorities, youth, children and adolescent, urban poor, LGBTIQ, and people displaced by conflict, disasters and climate change), and 5 sub-regions (South East Asia, South Asia, Central Asia, East Asia and the Pacific). For more information about RCEM, please click: www.asiapacificrcem.org. What is the Regional Coordination Committee? The Regional Coordination Committee (RCC) (formerly the transition committee) will be collectively responsible for facilitating and coordinating the work of the entire RCEM. See attached document for the roles and responsibilities of the RCC. Who are Eligible to Nominate/Be Nominated and Vote? An official list of all Constituents will be drawn up based on the online database of organisations who filled in and submitted an organisational profile to the secretariat and self-defined the Subregional and Thematic RCEM Constituencies they belong to. Only those organisations included in this list may be nominated as Focal Point and can vote. Please note that one organisation can have multiple representatives to the RCEM but is entitled to only one (1) vote for Thematic Constituency and only one (1) vote for the Subregional Constituency (as identified in the submitted organization profile). Self-nomination is allowed. You can only nominate or self-nominate and eventually vote within your main constituency and sub-regional listed in the database. i.e if you are listed as farmers, you can only nominate farmer constituency focal point, and NOT women focal points. A nominee will only be represented once in the responses spreadsheet. If a candidate is nominated more than once, the first nomination will be retained and all others removed. Candidates will be reviewed on how well they meet the criteria, not on how many people nominate them. 4-12, May 2015 Submission and Receipt of Nominations/Self Nominations. 13-15, May 2015 Review of Nominations and Release of List of Eligible Nominees. An external partner will be invited to review profiles and CVs of nominees and confirm the final list of eligible nominees. 16-17, May 2015 Facilitate discussion for consensus within Constituencies. Consensus decision-making is the preferred first method. 18-19, May 2015 If consensus is not reached, facilitate a voting process. The voting process will be done both online (18 May 2015), and physical election/voting (19 May 2015). Nomination Guidelines – refer to the document to see the roles/responsibilities of focal points, criteria, etc.